[Source: Sean Holstege, Arizona Republic] — The Valley’s light-rail track runs over 20 miles, but almost half of Metro’s crashes in the past year have occurred along a single mile-and-a-quarter stretch that runs through downtown Phoenix. The L-shaped route from Central Station to Seventh Street is packed with bars, businesses, pedestrians, and distracted motorists, a tough environment for even slow-moving Metro trains. Of the 52 crashes logged last year — an average of one a week since the $1.4 billion system opened in December 2008 — 23 have been in downtown Phoenix. Of those, 17 involved right turns along a few blocks of Washington and Jefferson streets. Metro recorded five crashes at just one corner: Jefferson and First streets. None of the crashes was fatal. 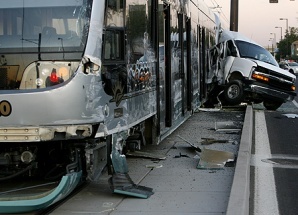 Many of the downtown Phoenix crashes arise from cars making right turns across the tracks. A red arrow prohibits the maneuver, but split-second instincts and years of conditioning tell drivers it is OK to turn right on red. Posted on January 18, 2010, in Public Safety, Transportation and tagged Adrian Ruiz, Downtown Phoenix, Light Rail, Valley Metro. Bookmark the permalink. Leave a comment.